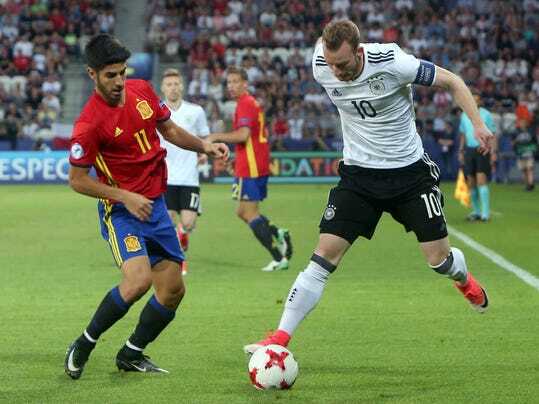 KRAKOW, Poland (AP) — Midfielder Mitchell Weiser scored the winning goal as Germany beat high-scoring Spain 1-0 to win the Under-21 European Championship on Friday. Spain was in a formidable form in the tournament, scoring 12 goals in four previous wins. But the favorite failed to replicate its flowing attacking football in the final. The Germans, after knocking out England in a penalty shootout in the semifinals, secured a second title in this category after success in 2009. Spain was seeking its fifth European trophy after it eliminated Italy — the most successful team with five titles — 3-1 in the semis. The decisive moment of the match came five minutes before halftime, when Weiser headed in defender Jeremy Toljan’s cross from the right flank. It was a deserved goal for Germany following a dominant first half….